The magnetism of Michael Jackson’s music is undeniable. With a career spanning four decades, Michael sold over 750 million albums worldwide, scored 13 number one singles and won 13 Grammy Awards to match. But statistics alone are not enough to establish a legacy. Jackson was dogged by controversy – the artist’s eccentricities, questionable relationships and accusations of sexual abuse were a constant source of spectacle and public comment. The fact that Jackson’s Wikipedia page is the world’s third most edited (he places just after Jesus) demonstrates the fervor with which the global public still debates Jackson’s legacy. So, should Jackson be remembered as an artistic and philanthropic giant, or did Jackson earn the shadow cast upon him? Here are three arguments for each side. Jackson’s larger than life take on performance chiseled the path of modern artistry. Jackson revolutionized music videos and live performance. He pioneered a new era in music video, enchanting audiences with cinematic and special effects marvels like “Thriller,” “Black or White” and “Scream.” He even used magic to dazzle audiences on his multi-million dollar tours. Jackson once said: “An artist’s imagination is his greatest tool. It can… transport you to a different place altogether.” To be sure, Jackson was a master of transporting his audiences to places they’d never imagined. This feat has been globally recognized; in fact, London’s National Portrait Gallery recently opened an exhibit dedicated to the King of Pop’s artistry, displaying his legacy alongside the likes of other iconic artists like Andy Warhol and Frida Kahlo. He set the tone of modern celebrity philanthropy. Jackson gave millions in charity and was one of the first celebrities to establish his own charitable foundation. 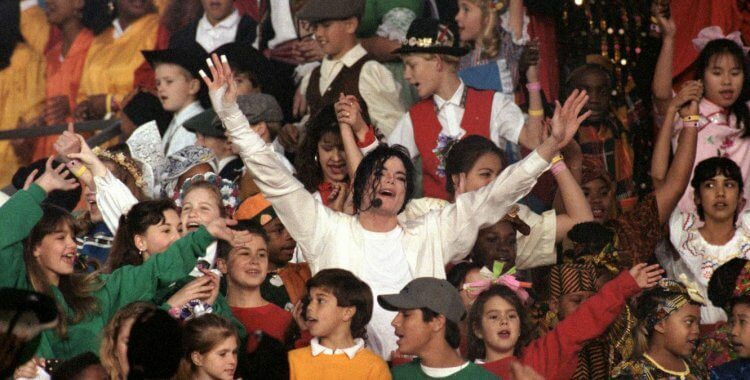 He used his star power to rally other performers to charity anthems like “Heal the World” and “We are the World.” His commitment to social justice was a recurring theme in his music. By setting an example of giving and arousing social consciousness with songs like “Man in the Mirror” and “They Don’t Really Care About Us,” Jackson popularized an ethos of harmony and shared responsibility. Controversy had cash value when it came to MJ. Jackson controversies were (and still are) a multi-million dollar industry. Tabloids buzzed with “Wacko Jacko’s” sale-boosting antics. One tell-all author, the artist’s former publicist, admitted to writing an unofficial Jackson biography because he was broke. Then, there were the claims of sexual abuse that Jackson settled out of court to the tune of $24 million. Other accusers followed, perhaps looking for a payout. Actor Macaulay Culkin, who was befriended by Jackson as a child, noted the family that had accused Jackson of molestation was quick to “take the money and run” (a reference, no doubt, to the family’s refusal to testify in criminal proceedings once a financial settlement had been reached). Jackson used controversy to generate buzz and celebrity. Michael Jackson’s exploits are well documented and bizarre, even by Hollywood’s standards. In the 80’s, his chimpanzee, Bubbles, was his constant companion. He built an amusement park in his backyard, had two spur-of-the moment marriages, and frequent changes in his appearance were ever-present in tabloid news. A former Jackson publicist alleged that Jackson’s antics were his version of wagging the dog – that Jackson leaked rumors about himself and behaved strangely to build celebrity through spectacle. Later, he tried to create marketing stunts like seeking knighthood from the Queen of England to deflect bad press – namely, accusations of sexual abuse against children. Jackson’s relationships with children who were not his relatives crossed important social boundaries. A 2002 New York Times article traces Jackson’s fading star against the backdrop of his bizarre behavior and accusations of child molestation, correctly noting that while the public is tolerant of artists with addictions, they are intolerant of any form of child abuse. Although Jackson settled the 1993 accusations of sexual abuse out of court and was acquitted of the accusations laid against him in 2003, Michael’s bizarre behavior, namely, his unusual relationships with children, underpinned the public’s suspicions. After footage of Michael holding hands with the young boy who would later accuse him of abuse was released o the press, a Gallup pole reported that most Americans believed that the charges leveled against Jackson were true. Charges of abuse continue to be filed against the singer’s estate years after his death. Even with the allure of a large settlement, the sheer volume of former acquaintances alleging abuse is unsettling. It stands to reason that if money were the only basis for filing frivolous lawsuits against celebrities, as Jackson so frequently claimed, there would be far more suits against far more celebrities. Indeed, when accusations of a particular crime appear in large number against one individual, as with the dozens of assault accusations brought against entertainer Bill Cosby, it is imperative to investigate. Bottom Line: Michael Jackson’s impact on popular culture is immeasurable and enduring. “Thriller” remains the world’s most sold album, and Jackson’s signature move, the Moonwalk, is as iconic as ever. However, fans must be wary of conflating talent with perfection – even in the presence of a showman as masterful as Jackson. What kind of impact did Jackson have on you?